Besides the obleas with arequipe (wafers filled with dulce de leche), another really popular dessert in Colombia is arequipe turnovers. Come to think of it, turnovers are very popular in Colombia no matter what they are filled with, guava, arequipe, beef, chicken, ham, cheese, pineapple, ham with cheese and pineapple (Hawaiian style), the list goes on and on. I have to say that I really love the taste of the puff pastry with the arequipe but making these pasteles, I have to be honest, it’s not my favorite thing to do because they always explode. Arequipe has a tendency to burst right through the seams and it almost always makes its way out of the puff pastry and into the baking sheet for some reason. If I make six pasteles, five of them will always explode, and I have tried everything like sealing the seams really well, filling them with less arequipe, baking at a lower temperature and this time I tried adding one egg yolk to the arequipe which I read is a trick used in Mexico but no, that didn’t work either. 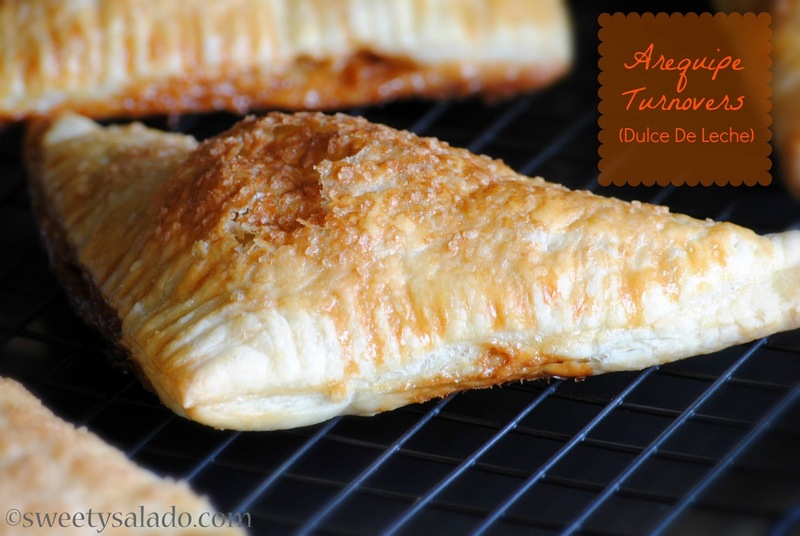 The good thing is, most of the filling doesn’t come out and you do end up with lots of arequipe flavor inside the turnover, besides, you can always drizzle it with more arequipe on top to make up for the loss. And remember how easy it was to make the sweet chicharrones a few weeks ago? These are just as easy. Just stretch out the puff pastry, cut it into squares, fill them with the arequipe, seal them and bake them. Twenty minutes later you’ll end up with the most amazing sweet treats which can be enjoyed with a nice cup of coffee. Oh! and let them cool a bit before eating them or you’ll burn your tongue with something similar to hot lava. Not fun. 1. Thaw puff pastry according to instructions. 2. Make egg wash by beating the egg with the water in a small bowl. 3. Flour a rolling pin, unfold puff pastry on a floured surface and roll it out so that it is about 1 inch (2.5 cm) bigger on all sides. 4. 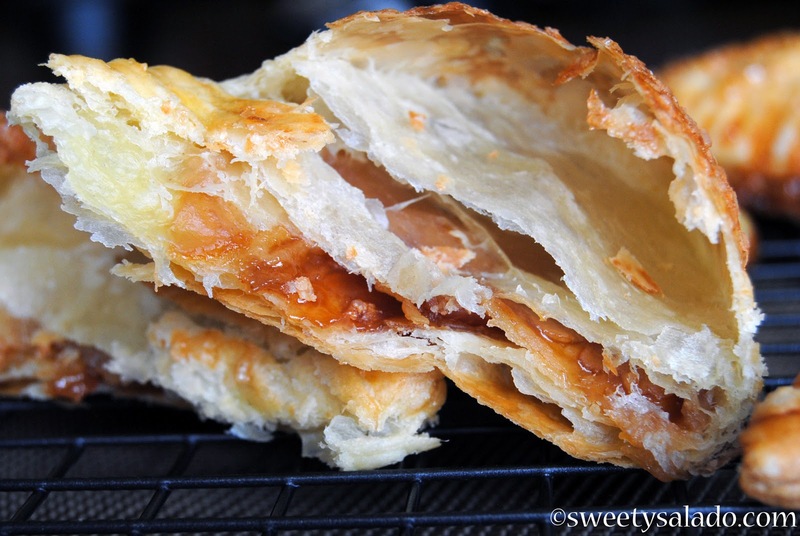 Cut puff pastry into 4 big squares and place 1 tbsp of arequipe in the center of each one. Brush the edges with the egg wash and fold over to make a triangle. Press with your fingertips to seal them, you can also seal them with a fork. Brush the top of each turnover with the egg wash and then sprinkle with sugar. 5. Place the turnovers on a cookie sheet covered with parchment paper and bake at 350ºF (180ºC) for about 20 minutes or until golden brown. Let them cool for a few minutes before serving.